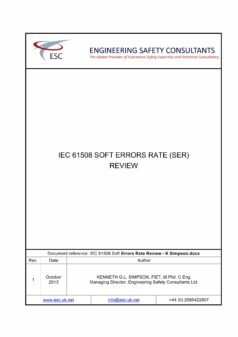 This paper provides a review of the effects of ‘Soft Errors’ in relation to IEC 615081 random hardware failures assessments. IEC 61508:2010 requires the assessment of random hardware failures (whether it’s Probability of Failure on Demand – PFD or Probability of Dangerous Failure per Hour – PFH) to include the failure rate for the devices incorrectly functioning due to software error caused by the temporary change in the stored program in the memory module. This paper examines the reality of this type of temporary error leading to an actual malfunction of the device.